The success of a listing presentation is determined by what you do before you even walk through the door. Most real estate agents enter the meeting flying blind, ill prepared and oblivious to the needs, wants, desires, and expectations of the prospect. Make this pledge to yourself right now: Before you enter another listing presentation, ask your prospects quality questions in advance. Ask questions that enable you to obtain important information about the customer’s desires, timeframe, motivation level, experience, and expectations of outcome and service. Without this information, you can’t possibly serve the client well. You won’t be able to sell your value as well either. Many salespeople, especially in real estate sales, think they’ll offend the customer if they ask questions. Without good client information, a listing presentation becomes an explanation of your services and service delivery system. But what if the prospect sitting in front of you wants to be served differently? Then what? The customer ultimately determines whether your service is outstanding, fair, or poor. Because the customer judges the quality of service received, the only way to start the service process is to learn what customers want, rather than trying to guess their desires and expectations. Additionally, your level of service satisfaction determines the level of referral volume you receive from that client in the future. Question listing prospects to safeguard your time. By questioning prospects before you meet with them, you assess their motivation, desire, need to take action, ability to act, and authority to make selling decisions. You also assess the odds that the prospect will result in income-producing activity. The questioning process increases your probability of sales success by determining which prospects are likely to result in commission revenue and which are likely to consume hours without results. Question listing prospects to determine their service expectations. What kind of service do they expect? What selling approach do they follow? Is there a match between your philosophy and theirs? If not, can you convince them that your approach is better than their preconceived notion of what and how you should represent their interests? If not, are you willing to turn down the business? The only way to address these issues is to learn what your prospects are thinking before you make your presentation. Before you enter a listing presentation, diagnose the situation you’re entering and the opportunity it presents by learning the prospect’s answers to key questions. Acquire this base of knowledge over the phone when you’re scheduling the presentation appointment. If you wait until you’re face to face with the prospect, it may be too late. By then you want to be offering a tailored presentation, not acquiring baseline information. Where are you hoping to move? Tell me about your perfect timeframe. When do you want this move to happen? Is there anything that would cause you not to make this move? How many properties have you sold in the past? When was your last sales experience? What was your experience with that sale? How did you select the agent you worked with? What did you like best and least about what that agent did? 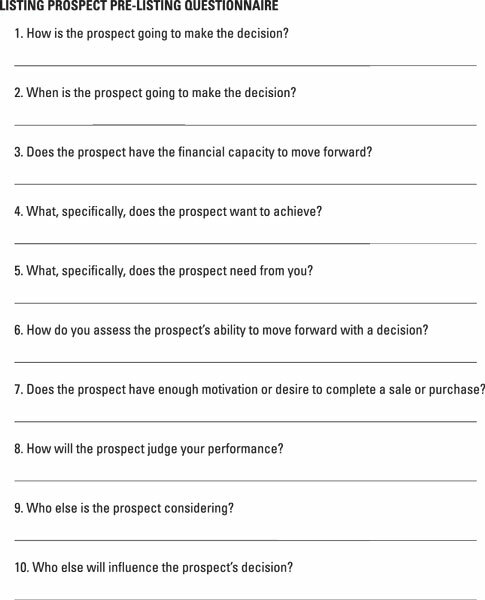 Pricing: The following questions help you gauge the prospect’s motivation or desire to sell. They’ll also help you determine whether the prospect is realistic about current real estate values. The higher the list price, the lower the motivation; the lower the list price, the higher the motivation. How much do you want to list your home for tonight? How did you arrive at that value for your home? If a buyer came in today, what would you consider to be an acceptable offer for your home? Most people do a little investigation on real estate values before they sell their home. What have you found? Most people have a general idea of what they want for their home. What’s yours? Service expectation: Learning your prospect’s service expectation is absolutely essential to a good working relationship, but when you begin to ask the service-related questions, you’ll likely hear silence on the phone. Likely your prospect has never met a service provider concerned enough to ask what he wants, values, and expects. As a result, you may have to probe and ask follow-up questions to help the prospect open up and enter a dialogue. What do you expect from the real estate agent you choose to work with? What are the top three things you’re looking for from an agent? What will it take for you to be confident that my service will meet your requirements? Following your phone interview, use the answers to questions in each of the four categories as you compile a qualifying questionnaire on the prospect. This figure provides a good format to follow. Complete a qualifying questionnaire as you prepare for each listing presentation.